OXFORD – Head coach Matthew Mott couldn’t help but smile as he watched Ole Miss sophomore midfielder CeCe Kizer and senior forward Addie Forbus lead the Rebels offense. He also couldn’t help but smile about how unselfish both players are. 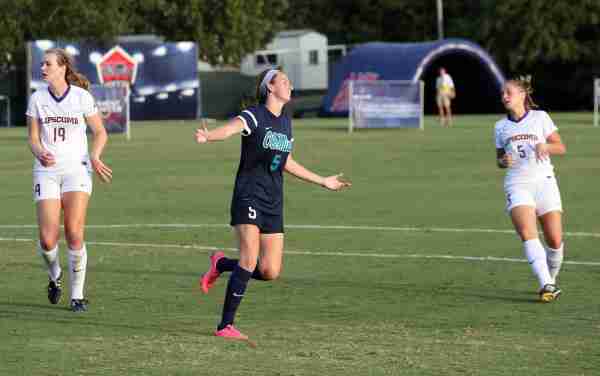 Forbus scored two goals and Kizer scored the other as No. 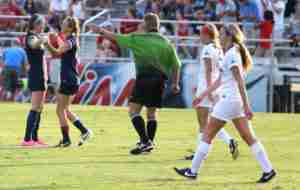 19 Ole Miss (3-1) defeated the Lipscomb Bisons (2-1-1) 3-1 Sunday evening inside Ole Miss’ soccer stadium. The Rebels held the advantage in shot attempts (22-6), with 15 of those on goal compared to only three for their opponent. Those guys are just so good together and with (Gretchen) Harknett in there, that’s a three-headed monster that’s pretty dangerous. They know how to attack and they get a good feel for each other, so that’s dangerous going forward. Addie is just on a really good mark right now, scoring goals and getting into really good position. We are feeding her good spots and she’s doing a good job finishing them. The teams traded possessions for the first 15 minutes until Kizer scored Ole Miss’ first goal of the game at the 25:25 mark. The goal was Kizer’s first on the season. Lipscomb quickly responded less than a minute later with a goal by senior forward Alesondra Colbert – assist from sophomore forward Maycie McKay – to tie the game at one goal apiece. Four minutes later, Kizer showed another side of her offensive attack when should found Forbus on the near left side of the field for her first goal of the night, which landed in the right corner of the net. The Rebels took a 2-1 lead heading into halftime. In the second half, Kizer and Forbus bandied the ball about with ease, toying with the Bisons’ defenders. At the 80:22 mark, Kizer made her way past two Lipscomb defenders only to find Forbus for her second goal on Sunday evening—which was 25 yards out into the right back corner. Forbus has scored seven of Ole Miss’ 10 goals this season and is just four goals away from tying her season total from 2015. She leads the SEC in scoring. The other three have come from Gretchen Harknett, Bella Fiorenzo and Kizer. Sophomore goalkeeper Marnie Merritt only had to make two saves for the Rebels as the Ole Miss backline continues to excel. Senior goalkeeper Anna Buhigas had 12 saves for the Bisons. Ole Miss at Michigan on Friday, September 2 at 7:00 p.m. CST.